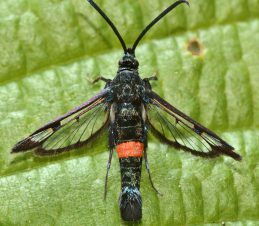 The apple clearwing moth is a wood-boring insect that feeds on apple trees and other fruit and ornamental trees. Apple clearwing are native to Europe, North Africa and Asia; however, the moth has been found infesting apple orchards in Washington and British Columbia. The pest was first confirmed in Cawston in 2005 and has since spread throughout the Similkameen valley and to different areas of the Okanagan valley. Apple trees are the primary host tree. Other less frequently infested host trees include apricots, cherries, crabapples, hawthorn, mountain ash, peaches, pears, plums and quince. Apple clearwing is a serious problem in high-density apple orchards.